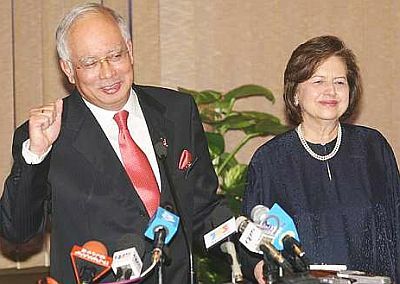 Datuk Seri Najib Tun Razak and Tan Sri Dr Zeti Akhtar Aziz at the press briefing. KUALA LUMPUR: The rise in residential property prices is still manageable and measures such as the My First Home Scheme will allow those in the lower-income brackets to own homes. Prime Minister Datuk Seri Najib Tun Razak said at a press briefing yesterday, following the annual meeting with Bank Negara governor Tan Sri Dr Zeti Akhtar Aziz, that the rise in house prices was being monitored. “We're watching the increase in property prices closely which we think is still manageable,” he said, adding that the My First Home Scheme, which was launched on Tuesday for those earning less than RM3,000 a month, was a people-friendly measure to enable the lower income groups to own houses. Those who qualify for the scheme can obtain 100% financing to buy their first home with a repayment period of 30 years for houses costing between RM100,000 and RM220,000. Najib added that the Government was also looking into the supply side of housing to see if measures had to be taken to build more residential properties around the RM200,000 level. According to data released by the Valuation and Property Services Department, the national house price index rose 6.2% year-on-year in the third quarter of 2010 after rising 6.2% in the second quarter and 5.7% in the first quarter. Najib said any new issues of Islamic bank licences and foreign banks looking to increase their shareholding in local banks would be looked at on “merit” and on a “case-by-case” basis. He said last week during a visit to Australia that the Government was open to allowing Australia & New Zealand Banking Group Ltd (ANZ) raise its stake in AMMB Holdings Bhd, which owns AmBank (M) Bhd. Currently the limit for foreign shareholding in local commercial banks is 30%. ANZ has a 26.59% stake in AMMB, making the Australian bank the single largest shareholder. Najib said the foreign shareholding limit for banks here would be reviewed individually and there would not be any changes to the Banking and Financial Institutions Act 1989 because this was an “administrative issue”. So far, there has been no proposal by ANZ to raise the bank's stake in AMMB and other foreign banks have also not applied. Meanwhile, Najib said the economy was expected to grow by 5% to 6% this year but would face challenges due to slower global growth, which would affect external demand. He said the challenges were from higher crude oil prices, inflation and the sovereign debt crisis in the euro-zone. “We'll monitor these developments closely and take the necessary steps,” Najib said. He added that several interim measures would have to be taken to support private consumption and investment should energy prices continue to rise to a “critical point”. However, Najib said the Government was committed to long-term subsidy rationalisation, although on a gradual basis, with savings from the lower subsidy to go to those in the lower-income brackets. Residential properties are expected to appreciate an average 13 per cent between January and June due to spiralling building materials and petrol prices. President, Real Estate and Housing Developers Association Malaysia (REHDA), Datuk Seri Michael Yam said:"Property prices in specific locations within the Klang Valley will remain extremely high due to expensive land cost". In the third quarter of last year, terrace houses in Kuala Lumpur were averaging about RM430,000. Yam said while government efforts to encourage first time home ownership, through the "My First Home Scheme", would promote the sale of properties priced between RM100,000 and RM220,000, there was a need to review the price limit to RM350,000 for properties in the Klang Valley. "Developers also face cost pressures in terms of absorbing road building cost," Yam told a press conference on property market trends this year. REDHA council member, Anthony Cho Tian Han, said developers faced several constraints in that they were not able to sell off every unit in a housing project as developers had to reserve a minimum 30 per cent for Bumiputera ownership over a long period of time. As for foreign buyers in the property market, Yam said, they were not as aggressive as many believed. "A majority of the buyers are still locals," he said, adding that Singaporeans, Europeans, Indonesians and South Koreans accounted for a cross-section of the foreign purchasers. AFFORDABLE housing is a subject matter which a great many homebuyers are talking about. Often, friends will comment how crazy the housing market has become. Those who own one house, which is their primary residence, might feel the pinch when it's time to upgrade. Those who own more are probably enjoying the growth in equity. For those who do not own a home and just starting their careers or a family, it's a nightmare for them. When salaries have not kept pace with the appreciation in home prices, the dream of owning a home becomes more distant by the day. Knowing that is a growing problem, the Government on Tuesday launched My First Home Scheme, a programme that will enable people earning less than RM3,000 a month to get 100% financing from banks to buy houses costing between RM100,000 and RM220,000 to be repaid over a period of 30 years. The monthly repayment sum should not exceed a third of their gross salaries but can go up to 50% if a bank allows for such a percentage. The premise of the scheme is great but the way home prices are going, one will find it hard to find a home between that price range in the major urban centres of Malaysia. It should be possible to find homes priced in that range in the rural and smaller towns in the country, but not in the major urban centres of the country. The plight of the young or those with a salary of up to RM3,000 a month over housing needs will exacerbate as urban migration rises. In 2009, according to Unicef, 71% of the population in Malaysia was urbanised but those flocking to the large and expensive cities will rise even further as the economy develops, more so as services widen its gap with manufacturing as the engine of growth. The other issue is the rising cost of living. Let's say a person working in Kuala Lumpur earning just under RM3,000 a month wants to buy a house costing RM220,000. If he or she is lucky to find such a house and is charged 4% interest over a period of 30 years, the person will have to pay around RM1,050 a month in house repayments. Knowing that houses costing that much would be a long way out, a person would most probably need to own his or her own vehicle and factor the cost of vehicle ownership, utilities and the ever-rising cost of food. He or she will do well to balance his ledger at the end of every month. The best solution, as I have said before, is for the federal and state governments to actually build homes costing that much in the major urban centres for the public to buy because I don't think there is a private sector developer in town who will be willing to sell homes at that price. Deputy news editor Jagdev Singh Sidhu wonders if it's even possible for a higher middle income family to afford a second house in Kuala Lumpur. More than RM400,000 in grants have been approved for four physical rejuvenation projects in the heritage city. Khazanah Nasional Bhd - via its wholly-owned unit Think City Sdn Bhd - will re-introduce the affordable housing concept into George Town's World Heritage Site in Penang via its public grants scheme - George Town Grants Programme (GTGP) - this year. Think City's programme director Dr Neik Khor yesterday said more than RM400,000 in grants from the GTGP have been approved for four physical rejuvenation projects in the heritage city. They include a restoration project along Lebuh Pantai for communal student housing, and another rejuvenation of 10 shophouses belonging to Wawasan Open University for a student hostel. "In line with Think City's objective to encourage private sector and civil society initiatives to promote economically sustainable housing models, these projects were chosen for their potential to kick-start regenerative efforts in their respective locations," Khor told a media briefing in Penang to announce Think City's third tranche of GTGP. A total of 18 grants worth RM1.18 million under the scheme's third round have been approved and 17 of these are for physical restoration projects. They include the refurbishment of the Penang Road Catholic Cemetary (RM21,600), restoration of the Nagakavidhu Chettiar Lodge (RM62,000) and the repair and restoration of the Datuk Koya tomb (RM25,120). Think City was set up in 2009 to manage urban rejuvenation in the Unesco world heritage site of George Town. The GTGP , a Think City initiative, was launched in December 2009 and three rounds of grants applications have been conducted. George Town's historic city, which was nominated by the government for world heritage listing together with Malacca, covers 109.38ha on the island's north-east and is known as the core zone. Surrounding the core zone is a 150.04ha band referred to as the buffer zone. "At the close of round three," Khor noted, "Think City has 34 physical conservation projects, 16 cultural mapping porjects, 3 shared spaces projects and 6 technical assistance grants." Think City now manages 60 projects with approximately RM6.9 million committed. "Based on the same principles we applied with the earlier three rounds of grants which are aimed at protecting George Town's outstanding universal values while helping in the process of urban regeneration, projects for round 4 of the GTGP must be catalytic, build capacity via partnerships and include a developmental element, among others," Khor said. Kuala Lumpur: Real Estate and Housing Developers' Association (Rehda) Malaysia expects property prices to increase up to 20% in the next six months in general as material and land costs continue to rise. Its president Datuk Seri Michael Yam said on Thursday, March 10 that building material costs increased 5% to 10% annually. For instance, steel bar was transacted at RM2,350 to RM2,580 per tonne at end-2010 from RM1,800 at end-2009. Yam said at a media briefing for the 2011 property outlook that for the full year of 2011, property prices were expected to increase by an average of 13%. “The range of the increase will range between 2% and 50%, depending on the location and the development type. With higher property prices, condominiums are a good buy in KL, compared to terraced homes,” he added. The estimation is based on a half-yearly survey done by Rehda with its members, comprising housing and property development companies, as at December last year. Some 135 out of 972 members from all states, or 14%, responded. Yam noted that 58% of the respondents indicated they had increased their launch prices by an average of 11% (minimum: 5%; maximum: 40%) in the second half last year, compared to the previous launches in the first half of 2010. KUALA LUMPUR: GEFUNG HOLDINGS BHD is making its foray into Indonesia and is planning to undertake a mixed development property project in east of Jakarta. Gefung said on Thursday, March 10 it had signed an MoU with PT Greenworld Development to undertake the project totaling 50.74 acres east of Jakarta. It said the proposed involvement in property development was in line with the group’s strategy to diversify its revenue stream. It said the site was along Jalan Pengangsaan Dua, Rawa Terate Village and surrounded by established neighbourhoods in the Kelapa Gading sub-district which is mainly a middle to upper middle class area. It added Kelapa Gading had six shopping malls within a 20-km radius and it was 14km from central Jakarta. PETALING JAYA: The proposed Kuala Lumpur-Singapore high-speed rail link has gained support owing to its potential to boost growth and there are also concern the project could burden the Government with financially. A transport consultant has come out in support of the proposed high-speed rail link between Kuala Lumpur and Singapore saying such a service would be a boost to growth ambitions of Malaysia. But others cautioned about the cost of such a project on government finances, pointing out that the mass rapid transit (MRT) project for Greater Kuala Lumpur and the extension of the light-rail transit (LRT) project is estimated to cost a staggering RM57bil. Land Public Transport Commission (SPAD) recently said that the Government was conducting a feasibility study on the rail project. The proposal was cited as a high-impact project under the Economic Transformation Programme. It was reported that the cost of the KL-Singapore high-speed rail was between RM8bil and RM14bil. Frost & Sullivan vice-president, Asia Pacific transportation & logistics practice and country head, Malaysia Gopal R said the KL-Singapore link was a critical and landmark link that needed to be established through high-speed rail. “This is a cross-border link that has already been leveraged by different other modes of transport like air and road. “With the next decade attributable to the growth of the services sector, a high-speed rail connectivity can greatly help organisations to leverage on Greater KL to establish larger offices with competent workforce that can commute most effectively in markets like Singapore. “In effect, Greater KL will transform into a service sector hub with this model, if high-speed rail connectivity is available towards the north and southern directions, creating a sustainable economic profile for the city,” Gopal told StarBiz. A transport analyst with a local research house said although there was a need to establish KL-Singapore high-speed rail, the high cost of such a project remained a concern. “This is because we already got two huge rail projects in hand the MRT system that is estimated to cost RM50bil and extension of the two LRT systems that would cost RM7bil. “Alternatively, the Government could rely on the private sector to fund the project. “But, the proposal is still under study. If it is proven viable, I think it would only kick-off in 2012 because the project involves cross-border link,” he said. On the timing of the high-speed project, taking into consideration that countries globally are still recovering from the economic crisis, Gopal said the economic activity in Malaysia as well as the region was on the rise and the momentum would surely continue into the immediate future. “Therefore, the timing is just right to embark on high-speed rail projects,” he said. Gopal added that almost all high-speed rail networks had been promoted as a tourist experience and consequently been a must see attraction cities such as in Shanghai, Taipei and Tokyo. “The connectivity options in any mega city has certainly influenced property values due to the ability of residents to save time in commuting,” he said. SPAD said it was currently conducting a feasibility study on a high-speed rail link between Kuala Lumpur and Singapore, which is expected it to be completed in May. “The study will look into the viability, business case, benefits and the possible implementation plan of the project,” it said. On the types of systems for high-speed rail, it was reported that there were basically two main systems namely, magnetic levitation technology and conventional rail network.